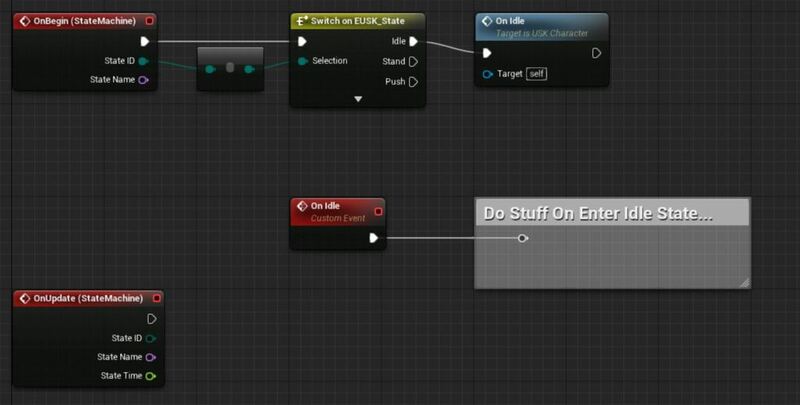 I've developed a Plugin module which adds to the UE4 environment a bunch of functionality regarding FSMs, so then I could stop trying to address a bazillion 'If Then Elses' everywhere. I haven't published this yet, but as always, I believe this may be useful for many other Unreal developers so I'm posting to share. 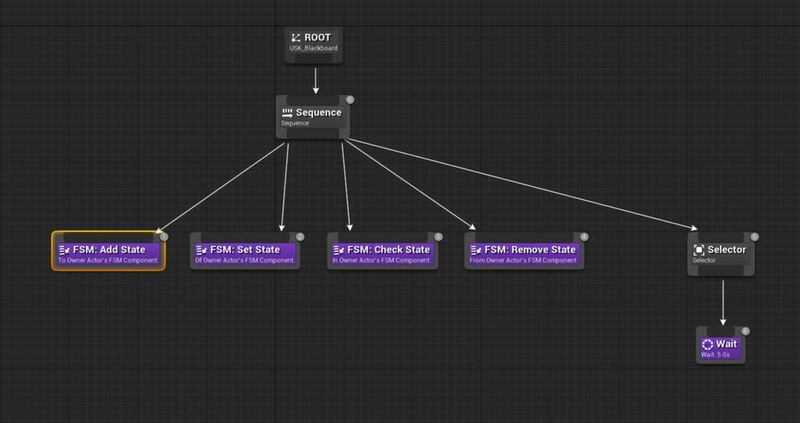 Would anybody be interested in this, a FSM Component which allows you to use AnimGraph's State Machines as visual editors?! Btw, it can be used not just within Animation Graphs, it's very integrated with C++ API, Blueprint nodes, Behaviour Tree nodes, giving us many 'ins and outs' to access the same FSM Component. * Blueprintable Finite State Machine System. 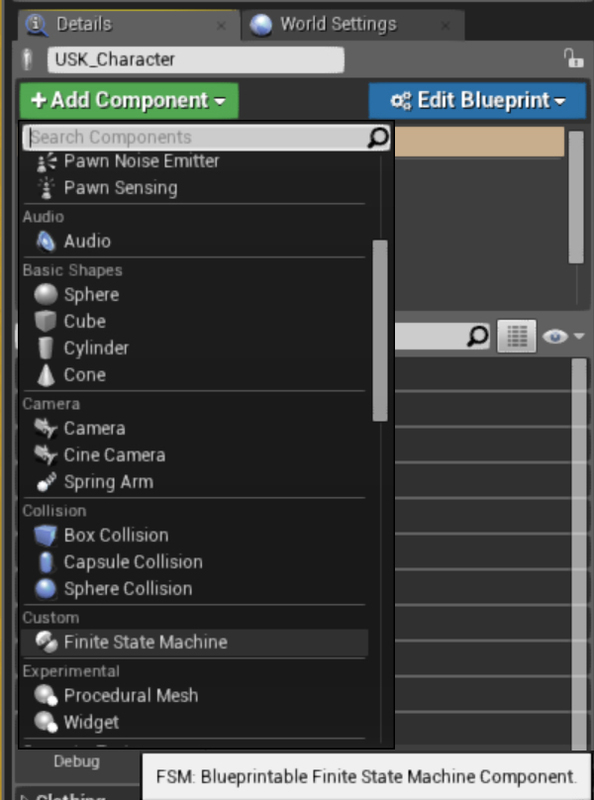 * Blueprint Actor Component Based. * Event-Based Tasks/Actions can be Broadcasted. * Supports Enumerators as State ID. * Supports Runtime State-Machine Creation/Deletion. * Supports Runtime State-Machine Event Bindings. * State Machines can Tick and Track Update Time. * FSM Properties can be Replicated. * Get/Set States from C++, Blueprints, Animation Graphs, Behavior Trees. I'd be interested to look at it. This is probably a really stupid question... but how well does this work with replication? All its UProperties will replicate just fine in an replicated Actor. Current State time, Active State ID, List of existing States, etc, are replicated. 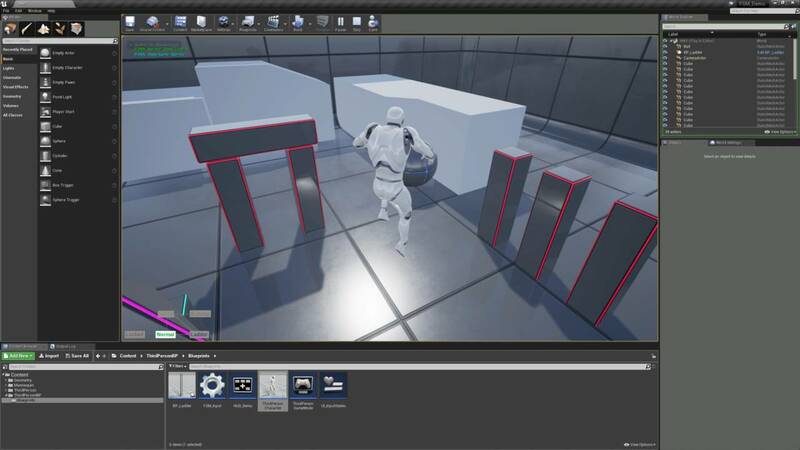 Source is also open so a programmer can customize multiplayer behavior if project has specific needs. Good job! 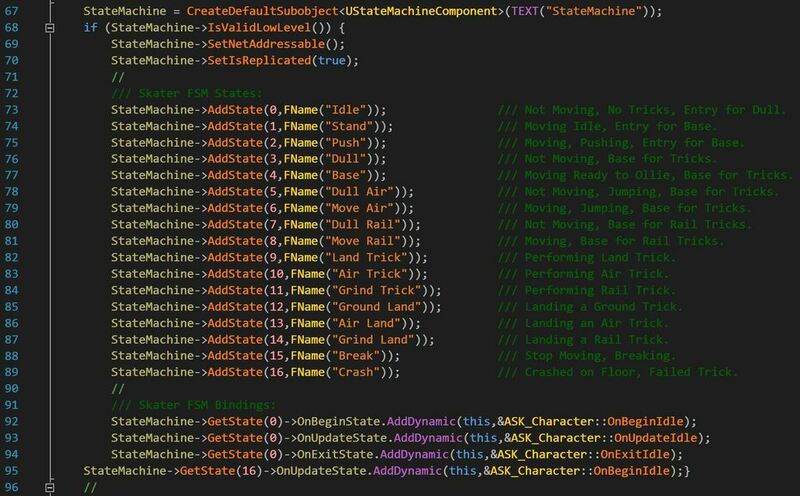 My question is, can we change current active state in an existing animation blueprint by changing it's parent to UStateMachineComponent or somehow, directly without manipulating transition conditions? In that case you can do it from any animation blueprint's graph; doesn't need to be a child of a specific Animation blueprint. 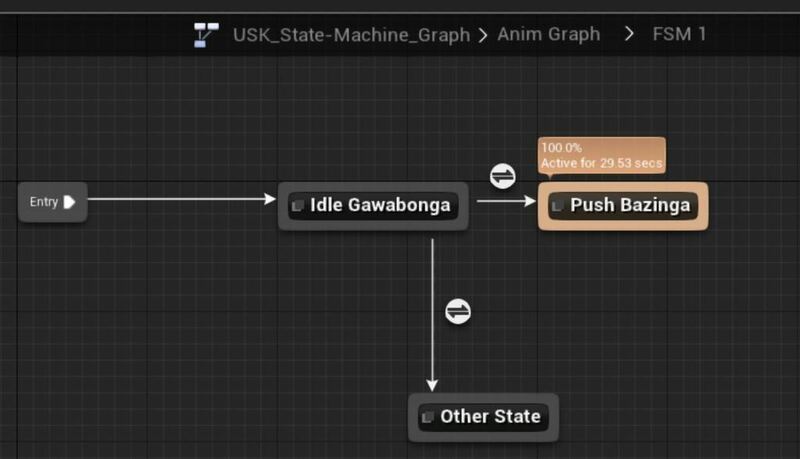 From the anim graph is possible to call a node: GetFSMComponent (Name) --> Set State (by ID or State Name). There's a saying "FMS isn't useful until you use it" or "You don't need FSM until you do"
In Blueprints we can emulate FSMs with boolean checks, switch on bool, etc. That works, but is hard to keep a "visual representation" of that pseudo-FSM and is kinda easy to get lost with so many bool checks. If I simply set a FSM State to "Crouched" then automatically my controller will block actions for jumping and I no longer need to go in the input section and say "If not Crouched than Jump". Btw, Android should be supported; depends on the build provided by Marketplace team. 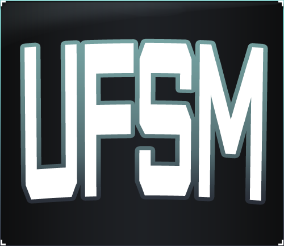 And yes, I may give some examples of common Blueprint setups and their FSM variations; I just wait to see where users will focus usage for FSMs. AI, player states, input, character attributes, etc. Nice one Bruno, I've been ******** about the lack of a simple FSM implementation that uses the existing editor for a few years now but never had time to implement one. Will definitely get this as its really helpful for UI work. Oh and while we're at it, any chance of a HFSM? I mean simple state machines are useful by themselves, but having a hierarchy available always gives more power.